Get the data: How long can you expect to wait at A&E in the West Midlands? A longer version of this post can be read in today’s Birmingham Mail. You can find out how to do the same report in your own area here. If you’re going to have to go to an A&E department in the West Midlands, don’t turn up at 1am – you can expect a long wait. That’s according to NHS figures which identify that time as being the worst for long waits across the region: the average patient arriving between one and two o’clock in the morning waits for almost three hours. The most recent figures, for 2010/11, are published on the Hospital Episode Statistics site, HESonline. They show that the worst time and place for impatient patients across the West Midlands Strategic Health Authority was Mid Staffordshire between 4am and 5am, where the average patient waited over three and a half hours – not far off the four-hour limit on waiting times which was lifted in April 2011. Patients could have driven to another hospital and still be seen sooner: in neighbouring South Staffordshire, for example, the highest average wait, at midday, was only 44 minutes. Across the region a quarter of hospital trusts had average waiting times of over three hours at the worst times – generally the hours after midnight. Of the three main hospital trusts In Birmingham – Sandwell and West Birmingham, University Hospital Birmingham, and Heart of England (we’ve excluded Birmingham Children’s Hospital) – it is Sandwell which had the shortest average waiting times throughout the day, until 9pm, when Heart of England had the honour for a couple of hours. Patients had to wait longest in almost every hour of the day at University Hospital Birmingham NHS Trust, which runs the Queen Elizabeth Hospital. This is despite the trust’s A&E departments dealing with around 82,000 unplanned attendances compared to well over 200,000 at A&E departments within the other trusts. 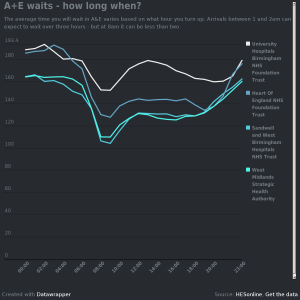 The difference between waiting times at different A&E departments averaged around half an hour, but was as high as 45 minutes in the mornings. More broadly, of the hospitals under the West Midlands Strategic Health Authority, the notorious Mid Staffordshire NHS trust stands out as having the worst record for waiting times: almost one in ten people had to wait over four hours in A&E during the period when data was being collected. The figures are worse when planned attendances are taken into account. The Heart of England NHS Trust – which runs Heartlands, Solihull and Good Hope Hospitals – didn’t fare much better, however, with more than one in 20 having to wait over four hours. At that time the trust was the most complained-about in the country. There is more recent data available on waiting times as a whole: the Department of Health publishes quarterly data, with the most recent covering July-September 2011. By then both Mid Staffordshire and Heart of England’s waiting times had improved slightly, with just under 7% of patients having to wait over 4 hours at Mid Staffordshire, and almost 4% at Heart of England. Of course waiting time data isn’t always reliable. In October of last year NHS managers were warned not to leave patients in ambulances: a practice called “stacking” which is one of a number of methods used to meet waiting time targets. The data on A&E was taken from the Hospital Episode Statistics site, HESonline. The most recent data at hospital trust level is from 2010-11, so bear in mind that this data is over a year out of date. This entry was posted in Uncategorized and tagged Good Hope Hospital, Heart of England NHS Trust, Mid Staffordshire NHS Trust, Queen Elizabeth Hospital, stacking by Paul Bradshaw. Bookmark the permalink.